Grammy's (albeit dirty) garden card makes a fun ride! This card is truly awesome! I love how you designed it, the colors you chose and the embellishments. What put it over the top is the EF and sponging you used, accenting the bumps on a toad or frog. I also enjoy your Cassidy pics! This is an adorable card, LeAnne! I love the toad on the swirls. They remind me of a lily pad! That Cassidy will be on a skateboard next! Toadally adorable! Love the green bumpy backdrop......lol......very toad like! And that Cassidy is in it to win it! Oh my gosh, how cute is this!! Love this little fella LeAnne, adorable card!! The things little ones pick out to play with over their toys! Looks like she was having FUN!! What a great card, LeAnne! You've combined a whole bunch of different stamps and elements into a toadally awesome creation. It will make anyone smile! Great coloring and I love the swirls behind Mr. Toad--awesome! I think this would work perfectly for a gal too! Love the design! Toadally cute card! I like the fun details you added to make it so special. LeAnne this is adorable! Love that cute little froggie! Toadally awesome indeed - I love your cute frog card! I think its the swirls and embossed panel that really make it stand out LeAnne - great take on my sketch this week! I toadaly love this card! The little green pearls are the perfect finishing touch to her "lily pad". Wonderful card. 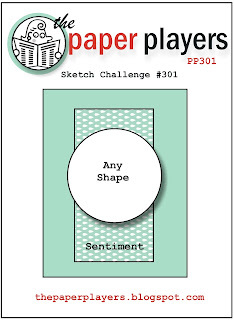 Paper Players 300 - A BIG Celebration! Paper Players 299 Patriotic Hi!